These colored artificial trees are prelit for easy set up. 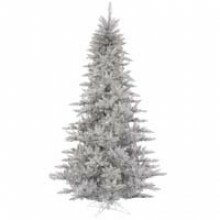 This 6.5 foot silver Fir lighted Christmas trees have bright metallic silver PVC needles. It has 700 clear lights, 1470 Tips and is 54 Inch wide at the base.